Noted. | FineStationery.com: Smile. Snap. Share. The digital camera you use to take your photo should be at least 3 megapixels (this means that a camera phone will generally not suffice). Make sure that your camera is set to the highest quality setting. Make sure your camera’s digital zoom feature is turned off before taking a photo. If you are scanning an already printed photo, set the resolution of your scanner to 300 DPI or higher. 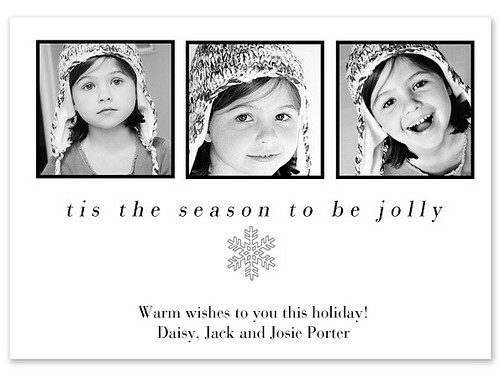 Consider how your photo size and shape will correspond with the photo card design. Capturing your child’s personality is really the key. Choose a clear, vivid photo with good lighting and make sure the background is free of clutter. Always, always order extras. Inevitably, you’ll remember someone you forgot to account for after you place your order. It is so much easier to have a few cards left over after the Holiday season than to place a second order with no time to spare. Read your camera’s manual to learn more about how to create the best print-quality photo.